In my career spanning 35 years during which I lived and worked in nine different countries on four different continents, Francien and I gained a close and personal behind-the-scenes view of diverse local communities, societies and workplaces. 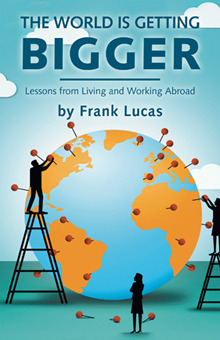 In my new book, ‘The World Is Getting Bigger’, I share these real-life experiences in a candid and insightful way, with personal reflections about living in different environments and among many and varied cultures. In particular, I ponder the inequalities I witnessed and the impact these might have on the future of globalization. There are some powerful messages here about stereotyping, migrants, religion, multiculturalism and human relationships. This book demonstrates that no matter how many places you experience, you never stop wondering and learning. It shows you that despite globalization, the world is not getting smaller. Who knows, it might make you think differently about internationalism and cultural perceptions. So how did I go about writing this book? Well, during the last 15 years I enjoyed making my own personal notes of what I have seen, experienced and felt. At least once a week I jotted down my thoughts and observations about my travels, the people I met, our adventures and our home. A few years ago, I realized that it would be interesting to derive some key lessons from all those experiences, which could be useful for others as well. During a 18-month period, on-off I sorted, and drafted, and paused, and researched, and re-wrote, and deleted, and rearranged some of those notes, and added lessons learned, into what has now become this book. Yes, writing is a time-consuming activity, but as I saw real progress after each major change it was a rewarding one. During that process, a writer-coach from the United Kingdom helped me to structure my thoughts, challenge my stories, make them more compelling and put everything in the right context. A real learning experience by itself! Lessons, doesn’t mean lecturing, but filtering out my personal key learning's for others to read about: that has been my intention. It is a book not only for people who have been living abroad themselves, but for all; aren’t we all part of an international social network? I know you will not always agree with my conclusions or advices, but that makes it even more interesting. In hindsight, one of the most difficult things during the writing process was to decide when the manuscript was completed and ready for publishing. In fact, it is never finished and the discussions which this book will evoke, will no doubt deepen some of my own lessons. You can use one of the following links to order on-line.